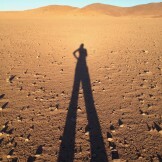 "Desert selfie" in the driest place on the planet: the Atacama Desert in northern Chile. If you want to go to Mars but can’t quite afford the hundreds of billions of dollars for a ticket, there is another solution: consider instead a trip to the Atacama Desert in Chile. This place is not a typical holiday destination, but for those of us who want that out-of-this-world experience, this is as Martian as it gets. The wettest part of the desert receives a mere 15mm of rain a year, and even that is a monsoon compared with the 2mm of rain that falls once per decade in the hyper-arid core of the Yungay region. When flying into the region last month on a small connecting jet from Santiago to Antofagasta, the closest town to the desert where I'd collect samples for my research, I stared out of the window at the Atacama below -- noticing the geomorphological similarities between the driest desert on Earth and many of the satellite and rover photos I have analyzed from Mars. The landscape is almost completely devoid of any plants and animals (even at the microbial level): your backyard probably has more biological activity than the whole of the Yungay region. And during the first day of my field campaign with scientists from NASA Ames Research Center and NASA Goddard Space Flight Center, our team drove approximately 600km through the Atacama; not a single insect collided with our truck’s windshield. In this desolate and extraordinarily dry environment, it is hard to imagine that Mars is still 1000 times drier than the driest part of the Atacama. In the Atacama, I had to readjust my perception of time and dominance of normal erosion processes. In most terrestrial environments, water is responsible for carving the landscapes we see. But in Yungay, the soils and boulders have been etched for millions of years by wind, the rare miniscule rainfall and extraordinarily, earthquakes. Scientists estimate that the Atacama has experienced approximately 30,000 seconds of rock-shaping shaking over the last few million years. The result is some of the most Mars-like terrains you can find on Earth. 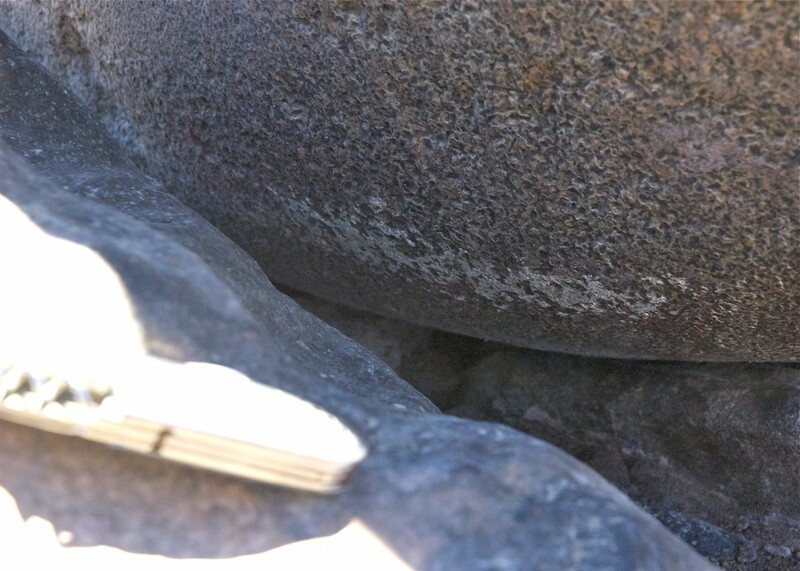 Boulders in the driest part of the Atacama are commonly marked by light-toned grooves worn into the surface by nearby boulders during earthquakes. When I began my Ph.D. over two years ago, I could have only hoped that my thesis project would have taken me to the most Martian place on Earth, covered from head-to-toe in a sterile suit, dust mask and gloves for hours in order to collect uncontaminated sediments for analysis. My research interests lie at the juncture point between geology and biology. I want to understand how exactly the chemical constituents that make up life get preserved in the rock record on Earth, especially in Mars-like environments. This will help to enable me to make a prediction about how and where we might be able to find molecular evidence of past life (if there ever was any) on Mars. 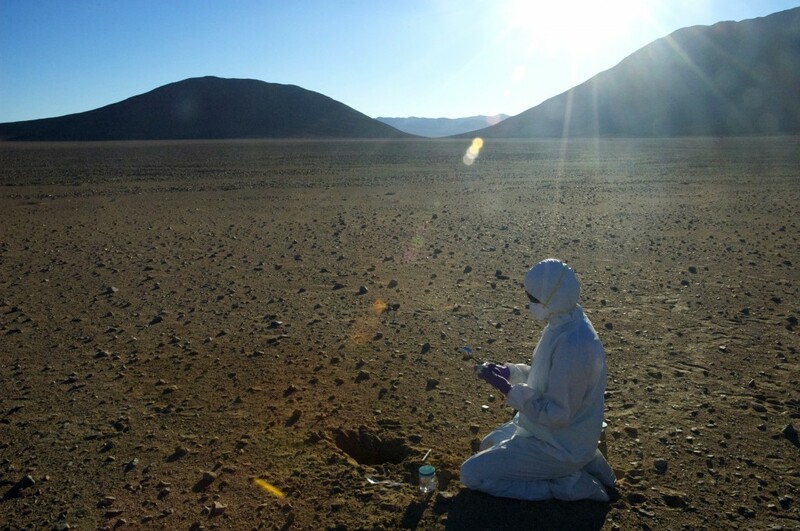 Clean sampling of biomarkers in the desert soil requires suits, gloves, masks, goggles, and sterile tools to make sure no contamination ends up in the sample. The utility of Mars analog environments like the Atacama is paramount. These unique locations provide a test-bed of sorts to begin to understand in greater detail geological processes occurring hundreds of millions of miles away on another planet. This is why many scientists, including myself, travel to Mars analogs to study geological processes up-close and to take samples back to our labs to examine them with analytical instruments that would be extremely difficult and costly to send to the red planet.